My friend Jim called a couple weeks ago and, with a minimal amount of coordination and fuss, I ended up at Double Spur Outfitters in Star Tannery, Virginia, on the last Friday in May with him, Charlie, and the older Dave (I am the younger, let’s remember). 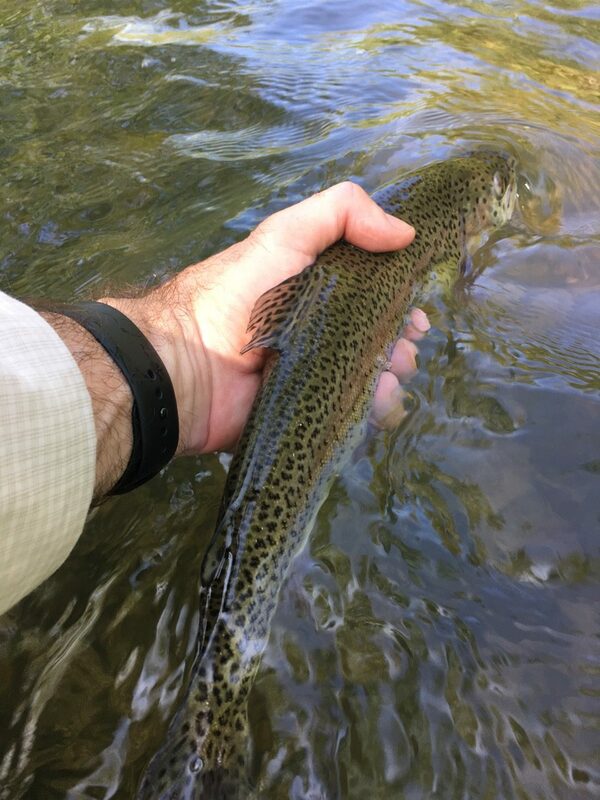 Though my preference is wild trout fishing, getting some stocked rainbows and bringing a couple home for dinner was certainly a fun time. I’ve driven over Cedar Creek a number of times at different crossings, and always wondered if it could be a good trout fishery. The owner of Double Spur, Levi, is making sure it is, at least in the upper section on the nearly four miles of stream that he owns. He has planted lots of big, stocked rainbows in the stream, along with some brook trout. Plus, there is at least one tributary that has wild brookies that may find their way downstream, though we did not encounter any.